So, I did and within a few weeks I started getting lovely letters from readers, all positive and telling me that it was great to be reading something interesting. After a couple of years, Rebecca decided that the column’s popularity deserved a bigger spread, so the little column became a headed page, with my name and a photo of me at the top. I think to reflect this they increased my fee to £75 and then after a couple more years to £100. For my part I decided to put more effort into my piece. Some weeks I would send perhaps a day travelling around researching and thinking about a story and another half a day writing up my notes. I’ve never been a greedy lad for money, so I always thought that for the effort I put in, the paper was getting good value. I have never claimed any expenses in all the time I have written the piece, beyond the fee. All bus and train fares and theatre tickets and purchase of books and music have always come out of my own pocket. Rebecca moved on a couple of years ago and I then corresponded and sent my pieces to a lady called Hannah Thaxter, who has been kind and supportive about what I write, indeed, when we decided to collect the best of my pieces together and publish them in book form, Hannah was good enough to write the preface for me. She wrote, ‘At the heart of every local paper are the stories and memories, the pride and the achievements of those who live there. We have been privileged at the Pontefract and Castleford Express to share with our readers such musings from local lad Ian Clayton. His column is a favourite amongst our readers.’ I’m very proud of that book and prouder still to say that it was a local best seller, in a district that doesn’t have book shops. I am writing to thank you for your excellent contributions to the Pontefract and Castleford Express over the years. Your column is highly regarded and has given an added bonus to Express readers. However, you will know how challenging it is to publish newspapers in a digital age and a time of great economic uncertainty. Most of the revenue on which we depend comes from advertisers and in tough times it is more important than ever that we live within our means. As a result, very sadly, we will no longer be able to pay for contributions such as those provided by yourself. At the end of the letter, John asked me to contact him if I needed to talk. I phoned him. I asked him to tell me why, if the column was popular and enjoyed by readers, they didn’t want it anymore. He said the decision was made purely on economical grounds and that all freelance writers were being laid off, apart from the ones who were willing to write for free. He hinted that I could continue doing the column if I was prepared to work free of charge. Writing is my job, I will not do it for free. I also told him that I thought the economical argument was a poor one; if readership decreases as a result then they have saved nothing. I also asked for a month’s notice, which he agreed to. Today, 24 March 2016, my penultimate column has appeared in the Pontefract and Castleford Express. I have written about aspects of local culture that disappear while you are not looking. I have also tried to let readers know that I will not be writing for the paper anymore. The Express have published my piece, but they have decided to leave out an important sentence. Here is the sentence they have left out. I really don’t know the extent of the changes and I have even less clue about who makes the decisions, John Kenealy told me that the decision to sack me was his. I suspect that he was told from someone above and that these people above have no idea of what makes this area tick. I will continue to be a supporter of local papers, but only if they remain loyal to the locality. I do not want to see my local paper, that I buy every week from the Post Office on Church Lane near where I live, become some kind of generic newsletter for big companies trying to sell stuff. I love writing for the Express and I know, because of all the feedback I receive that readers round here like what I put. If the purpose of a local press is to celebrate and uplift local life and culture, who then are these people in management positions who interfere with good things? We often hear that old saying ‘If it ain’t broke, don’t fix it’ these days. I’m more than happy to carry on doing something for localness, I want to carry on writing for the paper, but I won’t allow people I don’t know and who don’t know this locality to tell me that I must work for free in order to do it. I’m not that simple! An extract from Right Up Your Street by Ian Clayton, which is officially released on St Cyril’s day, 14 February 2016. It’s a long time since anybody sent me a Valentine’s card but there was a time when I got two in one year; alright it was a long time ago, forty one years ago to be precise, and I think they both might have been from Aunt Alice. I did a bit of digging and found out that Saint Valentine lived in the third century and was sentenced to death by Claudius for trying to convert him to Christianity. They threw stones at him to start with, then they hit him with wooden clubs and, when that didn’t work, they cut off his head outside the Flaminian Gate. That was on a Monday, 14th February 209 AD. I also discovered that Saint Valentine, as well as being the patron saint of love and lovers, is also the patron saint of bee keepers, the plague, epilepsy, people who faint, travellers and young people; he’s a busy lad is St Valentine. I wondered why he might be best known for instigating a multi-million pound card business and then I found a romantic little story about when he was in prison awaiting execution. One of his jailors had a blind daughter and Valentine performed his first miracle by laying his hands on the girl’s eyes and restoring her sight. Later he penned a note to the young woman and signed it ‘From your Valentine’. For such a famous saint, it might surprise you to know that there is not a single church in the whole of England dedicated to him, though there is one in Dublin on Whitefriar Street that has a shrine to him and a little vessel tinged with a small amount of his blood. And, in Rome, there is a church that was built for the athletes’ village in 1960 when they had the Olympics there and that’s called St. Valentine’s. For those of you who don’t believe in all the romantic malarkey, you’ll be pleased to know that today is also the feast day of that lesser known but, in my mind at least, very important saint. Yes, I refer to Saint Cyril. 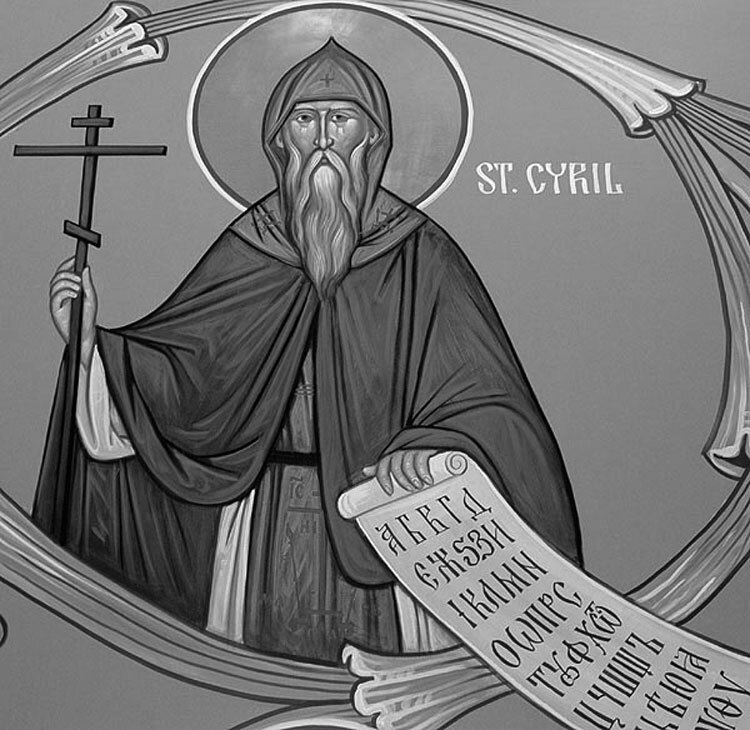 Cyril was a philosopher, a man of books and learning, he worked as a missionary in the 9th century and interests me because he believed in vernacular language. He made it his mission to help people to learn in their own tongue and translated most of the bible into the Slavic language of Moravia. Along with his brother Methodius, he became one of the fathers of the literary movement in that part of the world. He was of course punished for his efforts, like all these martyrs tend to be, but he should be remembered. So, if I don’t get a Valentine’s card today, and I don’t really expect to seeing as I haven’t had one since 1972, I shall console myself by raising a glass to Saint Cyril. Nice one Cyril! If Valentine and Cyril don’t do it for you, then consider paying homage to the other Saints who have feast days today, there’s plenty to pick from including Saint Abraham, the hermit of Syria; Saint Conran of the Orkney Islands; and Saint Antoninus of Sorrento, who once pulled a child out of a whale’s mouth after the little lad had been swallowed whole! I thought that while I was doing my saintly research I ought to look up the saints who have their feast day on my birthday. I came across Saint Hermione, a second-century martyr, venerated in the eastern orthodox church, who doesn’t appear to be the patron saint of anything; and Saint Rosalia of Sicily, who in young life was led to a cave by two angels. She then decided to spend the rest of her life there. I learned that academics often quote Rosalia on papers about bio diversity… not the most interesting of saints I have to say but then I discovered that I share my birthday with Beyonce Knowles. Now there’s a woman who I like the idea of blowing a few candles out with. I wonder if she’s free to come and sing at my party later this year? There is a launch event for Right Up Your Street at the Tap & Barrel, Pontefract, on Thursday 18 February at 7:30pm. All welcome.